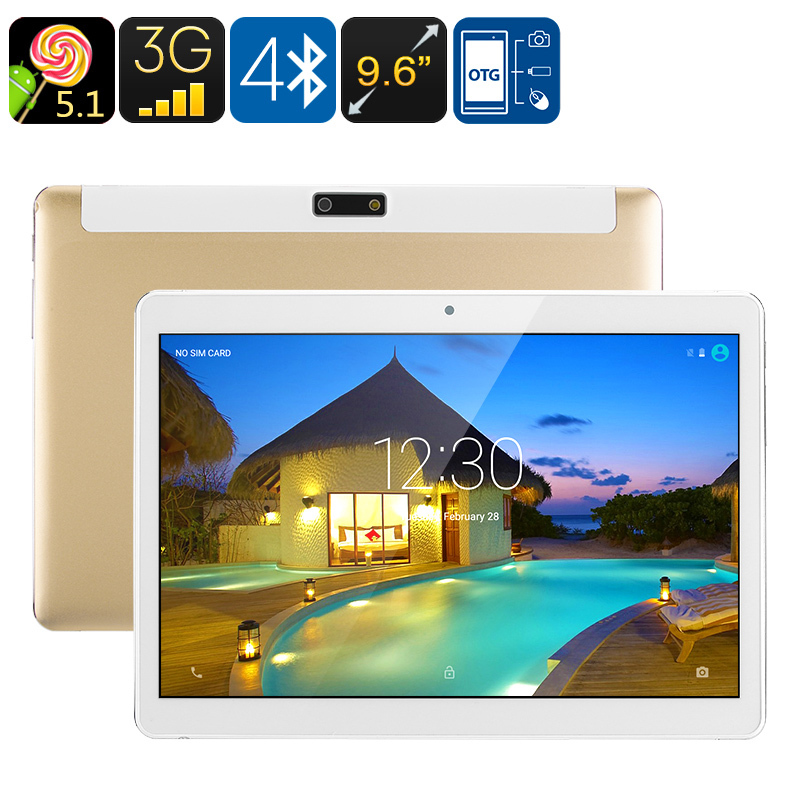 Successfully Added 3G Android Tablet PC - Android 5.1, Dual-IMEI, Google Play, OTG, Quad-Core CPU, 9.6-Inch IPS Display, 4500mAh to your Shopping Cart. This 3G Android tablet is the ultimate Android device for all mobile gamers out there that love to stay connected to friends and family anywhere they go. Featuring two 3G SIM card slots, this Android tablet PC provides you with high-speed data no matter where you're at. Its Dual-IMEI numbers further increase your overall connectivity, allowing you to be connected to two different network providers simultaneously – bringing along great efficiency for when traveling abroad. No matter where life will take you next, with this 3G tablet computer you’ll always be able to browse the web and play your online games without experiencing any lag. Featuring a sleek body and beautiful 9.6 Inch display, this tablet PC certainly is a feast to the eye. Supporting IPS technology, this stunning HD display brings forth breathtaking visuals and vivid color – allowing you to enjoy your games and media to their absolute most. With 16GB of internal storage and a 32GB SD card slot, this Android computer offers plenty of space for you to store all your files and media – allowing you to store and carry along hours’ worth of mobile entertainment at all time. Access to the Google Play store provides you with an abundance of free to download games and Applications, guaranteeing that from now on you’ll never have to experience a moment of boredom again while on the move. Within its thin body, this affordable Android tablet PC holds the Quad-Core MediaTek 6580 processor that brings along a speedy and energy-efficient performance. Whether you like to browse the web, play games, or watch a movie in HD resolution – this tablet computer is guaranteed to meet your demands. Additionally, it also supports OTG, letting you connect external hardware devices such as a keyboard, mouse, or gamepad to your Android device – significantly increasing your overall user experience. A powerful 4500mAh battery keeps this little beauty running for 3 hours in a row, providing you with enough time to watch a movie from beginning to end. Its sophisticated 0.3MP camera furthermore brings along great efficiency for those of you that wish to take part in online video calls. Whether you use it for your study, work, or entertainment – this 9.6 Inch Android tablet PC is there to meet all your demands. This 3G Android Tablet comes with a 12 months warranty, brought to you by the leader in electronic devices as well as wholesale electronic gadgets..
Arabic: - الجيل الثالث 3g الروبوت اللوحي - Chinese Simplified: - 3g 安卓平板电脑 - Czech: - 3G Android Tablet PC - Danish: - 3G Android Tablet PC - Dutch: - 3G Android Tablet PC - French: - 3G Android Tablet PC - German: - 3G Android Tablet-PC - Hebrew: - דור 3 אנדרואיד Tablet PC - Hindi: - 3जी एंड्रॉयड टैबलेट पीसी - Italian: - 3G Android Tablet PC - Japanese: - 3 G アンドロイド タブレット PC - Korean: - 3 세대 안 드 로이드 태블릿 PC - Malay: - 3G Android Tablet PC - Norwegian Bokmål: - 3G Android tablett PC - Romanian: - 3G Android Tablet PC - Russian: - 3G Android планшетный ПК - Spanish: - 3G Android Tablet PC - Thai: - 3G Android แท็บเล็ตพีซี - Turkish: - 3G Android Tablet PC - Vietnamese: - 3G Android Tablet PC.